Include fresh fruit and veggies for your pre-game. When folks arrive, they are usually hungry, so while you are putting the finishing touches on the main event, keep it light – offer up a platter of freshly cut vegetables (bell peppers, cucumbers, celery, carrots) and a plate of sliced fruit (e.g. apple or pear slices). Color – Don’t serve a plate of white food. Add oranges and greens to the table with fresh salads, sweet potatoes, carrots, Brussels sprouts, broccoli or green beans. Remember the “My Plate” strategy of filling half the plate with vegetables, and a smaller portion with starches. Use less butter and sugar. While some make the argument that “fat is back”, it’s still prudent to monitor the amount of fat (especially saturated fat) in your diet. Fat carries with it a lot of calories, so by using 3 tablespoons of butter over a whole stick, you can reduce the calories in a recipe by 70 percent! The same can go for sugar – in the sweet potato casserole recipe below, I reduced the sugar from a traditional recipe from 3/4 cup to 1/3 cup. Make mini-rolls and muffins. If you are baking up rolls, or using frozen bread dough – go small. Baking smaller rolls helps with portion control and allows guests to sample everything. I use mini muffin tins to bake cornbread with cranberries or mini banana muffins to go along with the meal. Offer sparkling waters or your own flavor-infused water. This has been a family favorite at our house since my children were small. My son is older now but still requests it. I use less sugar and marshmallows than traditional recipes, but it still has all of the fiber and beta-carotene goodness of the sweet potatoes. Put a large pot of water on stove to boil over high heat. Preheat oven to 350 degrees. Spray a 9 by 13-inch pan with cooking spray, set aside. Carefully put potatoes into boiling water and cook for about 15-20 minutes, or until potatoes are tender and soft. Remove from heat and let cool for about 5 minutes. Drain water and place potatoes into large stainless steel bowl and mash gently with a potato masher. Add sugar, milk, butter, salt and vanilla extract to bowl. Using a hand mixer or an immersion blender, mix potatoes for 1-2 minutes. Add eggs, continue mixing until well combined. Pour potatoes into prepared pan, spreading evenly, then bake in oven for 25 minutes. Remove potatoes from oven. Turn broiler on medium high. 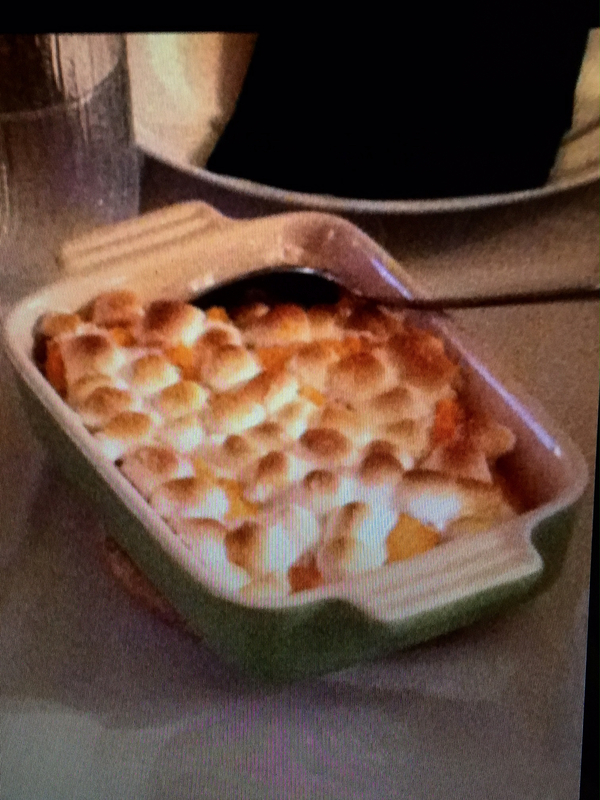 Pour miniature marshmallows evenly onto top of casserole, and place under broiler for about 1 minute (Watch carefully!) until lightly browned. Enjoy! This entry was posted in DASH Diet/Wellness, Easy Cooking, Family meals, Food Facts, Misc, Weight Loss and tagged healthy meal planning, holiday dinners, meal planning, sweet potato casserole, Thanksgiving, weight control by Rosanne Rust. Bookmark the permalink.